My wife backed into our mailbox and knocked it over. I had to replace it and I didn’t like the posts that are available at the big box store. After a quick search on google for some ideas and loosely followed the pdf plans from This Old House to make this mailbox post. I’m a little worried about moisture and what will happen over time. I coated the bottom part of the post with waterproof glue, and really spread it thick over the bottom surface of the plywood that wraps the base. Hopefully this will prevent moisture from getting in and breaking things apart. And if it does oh well. The most fun I had with this project was making the top cap. It is made from solid Poplar. about 1.5” thick. It started out 1.75” but I trimmed some off. 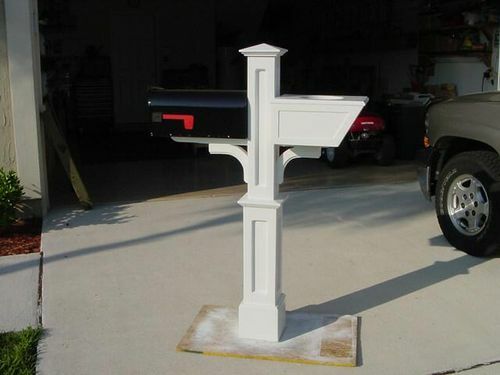 Your mailbox post looks great! I made one of these mailbox posts also a few years ago. I also used plywood just as you did and sealed everything the same way. But the plywood rotted out after about 2 years even with using a high grade paint; I had to rebuild the one I made. I’m in Florida so maybe you’ll have better luck than I did. When I rebuilt the one I made I used PT lumber and used Gorilla Glue and it now it’s holding up much better. Now I just give it a coat of paint once a year. You did a fine job on this mail box post. Also great looking mailbox to you too! Quick update: Total loss. The thing swelled up badly pulling apart all my nice miter joints. The post is rotting away. I’ll just have to make another:) This time i may try the MDO board that Norm uses in his build.